The dust is beginning to settle after the Whisperer War and the time has come for the people of Alexandria, the Hilltop, the Kingdom, and the Saviors to pick up the pieces and start to rebuild. What will that rebuild look like, and who will be leading the way? Like very good continuing story, this is a set-up issue to keep the narrative chugging along. While spending a moment at Andrea’s grave, Carl tells Lydia the tale of the time that he took the burden upon himself to kill the dangerous child Ben. Ben didn’t understand that killing his own brother was wrong because in his mind the dead now rise. Carl did what he had to and once he confessed to Andrea what he had done, she only expressed her love. That was when he first called her mom. Carl has decided to be his own man, returning to Hilltop to rebuild and leaving his father behind. Rick finally learns of Eugene’s radio correspondence with Stephanie from Ohio. Rick plans on opening his people to a larger world by traveling to meet this new community. His normal go to people are not so willing to comply. Jesus and Aaron are now a couple and do not want the danger. He then offers the job to Dwight but Dwight has a better idea. It is time for Rick to step down and for Dwight to take the reins. He holds a grudge against Rick for Sherry’s death and for the “work release” of Negan. This is foretelling an epic showdown between the leader of Alexandria and his most trusted General. In the end, Michonne volunteers for the mission much to Rick’s chagrin. Negan grabs supplies and keeps his word to leave the community and live on his own, but Maggie hasn’t forgotten nor forgiven Negan for Glen. She sends Dante to track and spy on the former Savior commander. 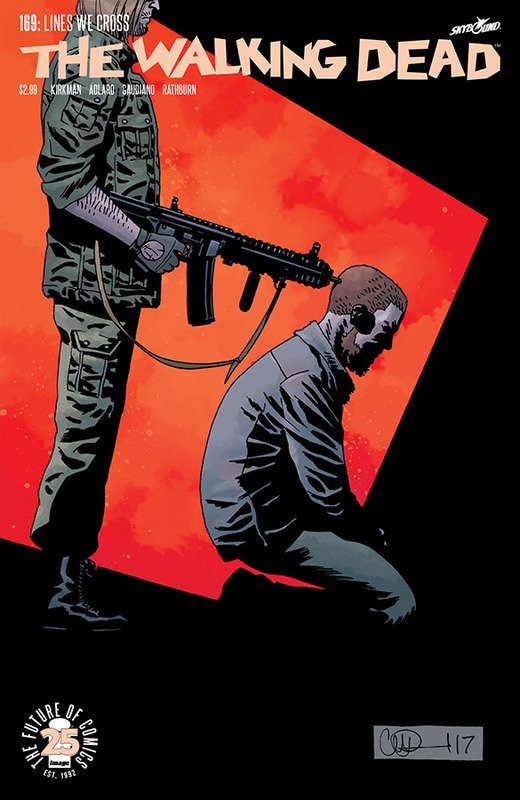 Per usual, Kirkman has expertly planned out the story for the next series of adventures and what this issue lacks in action in makes up for in depth. The dynamic of the leader against the wall is an intriguing one and it will be fascinating to see how Rick deals with this conflict without his trusted wife by his side. Buckle your seat belts boys and girls, it’s going to be a bumpy ride!